Landscape Architecture is the process by which a space is transformed into a place. Whether your goal is to create a breathtaking, elaborate outdoor experience or simply establish a basic planting plan to get your project approved; we exist to serve you! We have helped clients transform their spaces in a variety of different settings including; office, commercial, healthcare, urban development, parks and recreation, education, and special purpose gardens and facilities. We have the expertise to help you accomplish your goals and provide a design experience that you will enjoy. 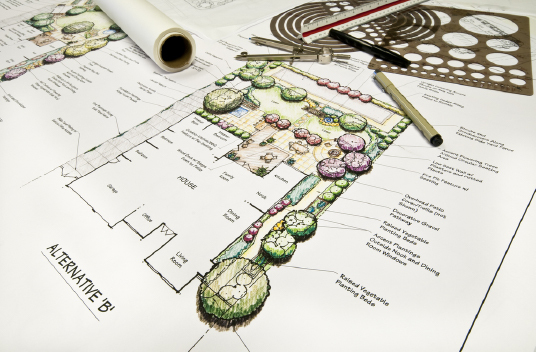 Because our landscape architects and designers are cross trained in civil engineering design, you can be confident we will deliver a product that makes sense both on paper and in the field. Are you responsible for public facilities such as schools, parks, playgrounds, sports fields, fitness facilities, forest preserves, streetscapes, community gardens, or special common areas? We can provide you with design expertise to develop your municipal or park district visions from inception through construction. Investments into a community infrastructure are extremely important and we want to help you get the best project with your budget. Once your playground is installed, it’s important to ensure that the proper maintenance and safety protocols are put in place. Our team of Certified Playground Safety Inspectors serve our clients by providing regular, thorough assessments of playground facilities. During these assessments our team observes and provides a comprehensive report on issues such as hazards, wear, deterioration, litter, and vandalism. Preliminary landscape plans provide the opportunity to explore design possibilities on a macro level. Through discussions about project arrangement, user experience, layout, material selections, colors, textures, and forms, we help our clients determine the best uses for their outdoor spaces. In this stage of the design, details go from macro to micro, and the final product comes into focus. After collaboration with our clients during the preliminary phase, we then produce a detailed, well thought out Final Landscape Plan for bidding, municipal approval, and construction. We welcome the opportunity to roll up our sleeves and engage with our clients in the field! We believe that the best landscapes don’t leave anything to chance. We recommend that our designers be involved in all facets of the process including: design; plant selection and tree tagging; field layout of landscape beds and plant material; and installation oversight. Once the project is complete, we help our clients ensure that the landscape plan they paid for, is what they got. We walk through completed sites and provide a detailed report with photos, highlighting missing plant material, improper installation, dead/dying plant material, and other warrantee issues. From large wooded lots to small urban sites, trees are a big deal. Our team of ISA certified arborists and landscape architects can help you understand what you have, how to best steward your property, and provide you with a plan to clearly communicate existing tree locations, size, species, condition, and removal/protection. Whether you are just looking to understand what you have on your site, or need a comprehensive plan for zoning or permitting approval; we can help. We visit the site, document the landscape in its entirety, and produce a plan clearly showing the current conditions. With Landscape Architects and Engineers working under one roof, our design team is equipped to provide comprehensive solutions to address your most challenging development issues. Together, we provide designs that work with nature to solve engineering issues and enhance the environment around us. Our team will collaborate on your project to address issues of wetland mitigation/restoration, stormwater detention design, and BMP integration. The right plants in the right places make all the difference in the success of your site. We also consider the long term by factoring in how our designs will be maintained in the future. Although often overlooked and undervalued, maintenance is a critical link in the chain, and our design team is committed to consulting on this issue for the benefit of our clients. It is critical that irrigation design work in harmony with the landscape plan and site engineering design. Because our team is made up of engineers, planners, and landscape architects that work under one roof, we help our clients avoid missteps that can occur when coordination and communication is overlooked. Our plans are easy to understand, bid, and install because of our collaborative design process.